Jane Tygesson’s work is based on some of the best research and strategies available in the emerging field of arts and aging. Jane Tygesson is author of the manual Opening Doors to Memory & Imagination to help museums create programs that engage the senses and spark conversation for people with memory loss. She is the Program Director of the Opening Doors initiative, through which she offers the book and services free of charge so that more museums around the country can offer tours to adults with memory loss. In recent years, Jane has worked closely with an organization in the Twin Cities named ArtsSage, which has broadened her expertise beyond museum work to also include working with communities on how they can integrate the arts with an an aging population. Jane also does consulting with individual arts organizations and senior living residences on how to create arts programming for seniors. 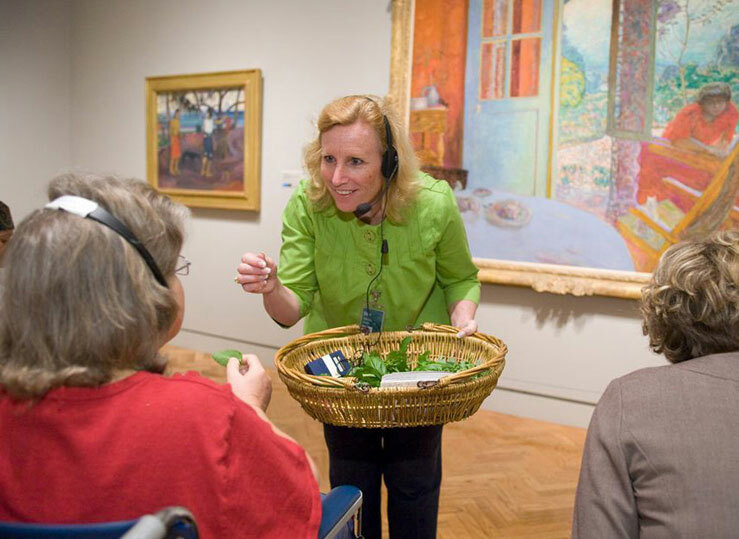 Jane co-founded the “Discover Your Story” program at the Minneapolis Institute of Arts (MIA) in 2008, which has brought more than 3,000 adults in the early and middle stages of Alzheimer’s into the museum with their families, friends, and care partners for interactive tours. Jane has since partnered with the SPARK! Alliance, with funding from the Helen Bader Foundation, to help support similar programs for people with memory loss at 11 cultural institutions in Wisconsin and Minnesota. Jane has spoken widely at conferences on the topic of arts and memory loss, including presentations at the National Art Education Association Conference, the National Docent Symposium, and the Association of Midwest Museums. Jane serves on the advisory boards for ARTSAGE and the Alzheimer’s Poetry Project MN, and served on the Early Stage Advisory Board for the Alzheimer’s Association Minnesota-North Dakota. Jane has been a docent at the MIA for 20 years and previously served as Gallery Director at Mongerson Wunderlich Gallery in Chicago. She currently serves as a trainer and coordinator for the Art Adventure program in local elementary schools. Jane has long had a passion for working with the aging, having spent ten years performing music in Twin Cities’ nursing homes and serving on two hospice teams. She also serves as a Lay Care minister at her church, Christ Presbyterian, in Edina, MN. Her particular compassion for adults living with memory loss has been shaped by her experiences with her mother and godmother. Jane holds a degree in Art History and Slavic Studies from Northwestern University in Chicago, which is where she met her amazing husband, Gary. Jane and Gary have two great kids with wonderful spouses who are now grown and have deserted their parents to create their own lives in Chicago and St. Louis (but she’s not bitter about it at all). Jane Tygesson has provided consulting and training for numerous leading arts organizations, as well as been a featured speaker at conferences and symposiums on arts and the aging nationwide. Three Artist Residencies – Integrating Art into a Senior Residence – How Does It Work? Jane Tygesson is the guiding light and driving force behind our program for visitors with memory loss at the Minneapolis Institute of Arts. Her vision, commitment, and more than 20 years of professional experience with people with memory loss led her to be the invaluable co-creator of the “Discover Your Story” tour program in 2008. She helped research existing programs, create mailing lists from scratch, and establish a partnership with the Alzheimer’s Association Minnesota-North Dakota to make sure we had a viable program. With the Alzheimer’s Association and museum staff, she has trained several cohorts of tour guides to facilitate these specialized tours. She is an excellent, thoughtful, and caring teacher and coach. She helped us introduce storytelling and poetry into the program, and assisted with a research project with the University of Minnesota. Her contributions don’t end there. In 2011 she reached out to medical students at the University of Minnesota to engage them in assisting program participants. This brilliant collaboration has greatly benefited students, participants, and the museum. Jane is an amazing woman with a vision and commitment to making a real difference in the lives of people with memory loss.